No day is the same working in the events sector, particular in the heart of London, so I feel very lucky to have a job that consistently challenges and rewards me, whilst working on some of the world’s best events. Following the treats we had on offer at our exhibition stand for attendees, I wanted to count down my Top 5 reasons for feeling lucky at East Wintergarden. 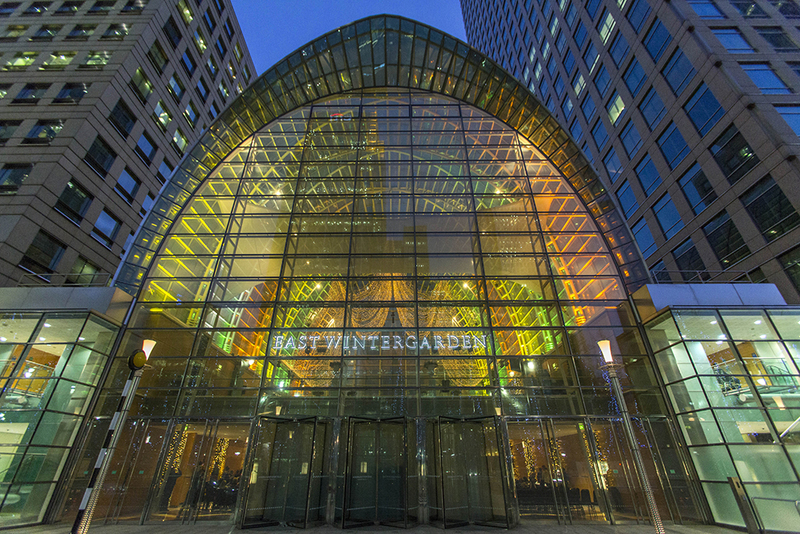 East Wintergarden is set against an iconic backdrop of Canary Wharfs’ towers in one of the world’s most popular capital cities on the international conferences and events map. Equally our venue shares an affinity with another event space on the other side of the globe, twinning our stunning glass-domed 27m high atrium with New Yorks’ Battery Park architecture. I’ve worked at the venue for nearly 12 years and have been privileged to be surrounded by predominantly the same key staff for the entire time. The in-house venue team have unwavering loyalty and dedication to delivering events in this special space – it’s a rarity to have such a longstanding team in today’s hospitality market where staff can be tempted to move onto new horizons every few years. Our working relationships are so strong, positively impacting our ability to handle any last-minute event turnarounds, production requests or challenging situations. Our exclusive catering partnership with Create Food means we benefit from an external supplier knowing our venue inside out and becoming a seamless extension of our team. This has a noticeable impact on a delegate’s experience at East Wintergarden, tasting dishes that are designed to feel immersive with the event, complementing the event styling and the venue itself. Opening our doors and welcoming in a wealth of talent from the country’s best production suppliers allows us to be able to keep ahead of the upcoming industry trends, advise clients on how to produce the ultimate ‘wow factor’ and generate new ideas on how to creatively push boundaries. With the Main Hall, The Gallery and Promenade Room all available for hire, our venue provides event organisers with a host of different set-up opportunities. Our Main Hall is complete with a stunning 27 metre glass atrium, uninterrupted Italian marble floorspace and beech wall panelling, overlooked by a suspended mezzanine gallery plus an adjoining room ideal for small meetings or as a green room. With a light airy atmosphere, the venue gifts us a modern blank canvas which can be transformed into any visual backdrop that can be conjured up with your imagination! We are fortunate to have access to state-of-the-art AV and in-house technology, combined with award-winning industry expertise. This killer combination means we frequently delight in repeat client bookings and enquiries as our top-notch service means customers consistently feel in safe hands – whether it be for a wedding, exhibitions or the latest national product launch! As well as privately hosted events, East Wintergarden also have a wide array of upcoming events open to the public including the Canary Wharf Squash Classic running on 10-15 March plus the contemporary design and craft fair MADE Exhibition returning to East Wintergarden on 28th-31 March. For event booking enquiries you can either visit their website https://canarywharf.com/east-wintergarden, or call the team on 0207 418 2725. Or why not follow their social channels @EWG_CanaryWharf and @YourCanaryWharf.